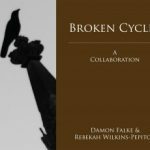 In Broken Cycles, a new collection of poetry and photography, thirty-three poems are dynamically paired with forty-four black and white photographs that reveal the gritty reality of the world along with our ability as humans to rise above it. Broken Cycles deals with themes of brokenness, man’s depravity, hope, and redemption in a three-part journey. The photographs relate with the written texts in a manner that serves to enhance the reader’s experience of both. Each poem provokes and is provoked by the photographic image. This unique book is a true collaboration between poet and photographer. A book of eerie beauty, a real gem. These are not poems and photographs but resurrections, words and images together bringing the dead back to life. …Stems / of watercress / sprouting / from the rabbit s / ears captures precisely the feel of these flowing alternations of poem and picture. You emerge from these pages with a new sense for the relation of memory and perception.